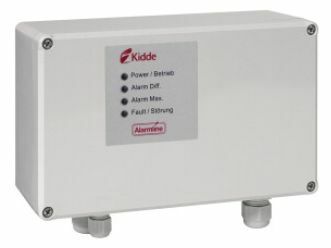 The Kidde LWM-1 Controller is an essential part of the Alarmline Analogue Linear Heat Detection system. The controller is able to monitor the Alarmline sensor cable and report changes in the temperature as and when they happen. The LWM-1 controller can configure the heat detection system using a number of switch settings, enabling the setting of alarm trip settings, system sensitivity etc. The Kidde controller has dual alarm functionality which provides system flexibility. It is simple to connect the controller to the main fire alarm system through the use of Volt Free Changeover contacts for Alarm and Fault conditions. Alarm and fault conditions can be stimulated and also reset using internal push buttons. There is an input in the unit which is always monitored allowing a remote reset facility. The unit can also be reset without removing the cover using a connected key switch or volt free switched output. The unit is only able to be reset when the alarm or fault condition has been removed. The controller comes in a compact ABS enclosure rated IP65. The Kidde LWM-1 has been approved by VdS to European standard EN54-5: 2000. The maximum sensor cable length for this product is 300m.